Right now AMD Ryzen may be the epicenter of all hype and enthusiastic excitement, but that doesn’t mean that Intel is sitting idly! Far from that, the company is prepping its new line of Kaby Lake processors for an early 2017 launch. 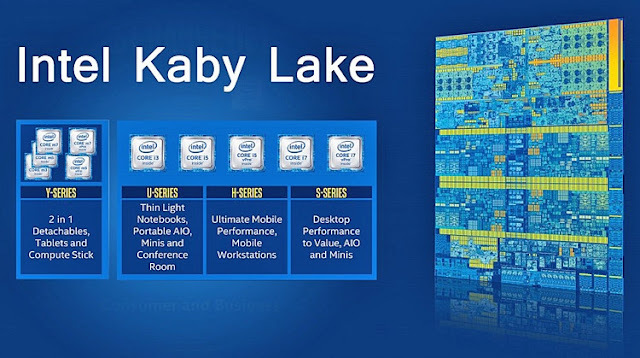 Kaby Lake is the codename of the 7th generation of Intel’s core-architecture, succeeding the 6th –gen core known as Skylake. Consistent with Intel’s monolithic and scalable design approach, this new core will cover a broad range of arrangements and power a vast array of devices ranging from 4.5Watt 2-in-1s to 91Watt mainstream desktops. Thankfully, Kaby Lake is much more of a known entity compared to Ryzen. Mobile Kaby Lake parts are already out in the market with a few reviews online and we have a pretty good idea about the desktop side too. Here, we’ll try to highlight the important bits. Kaby Lake is essentially a revision of the existing Skylake cores. The architecture doesn’t change at all which also means that the IPC improvement compared to last-gen will be negligible. So any boost in measurable performance would have to come from increments in CPU frequency. Kaby Lake is built on a 14-nanometer fabrication process just like its predecessor Skylake and that marks the official retirement of “Tick-Tock”, Intel’s famous development and manufacturing cycle. Skylake, being a Tock (new CPU-architecture), was supposed to be followed by a Tick (shrink in the process node). But that’s not going to happen anytime soon as after Kaby Lake, Intel has plans for “Coffee Lake” - yet another refinement of the 14nm process node before we see the eventual move to 10nm in form of Cannon Lake. This new development model is dubbed “process-architecture-optimization” and according to Intel, this allows the firm to spend more time optimizing an existing process, bringing tweaks and improvements along the way. 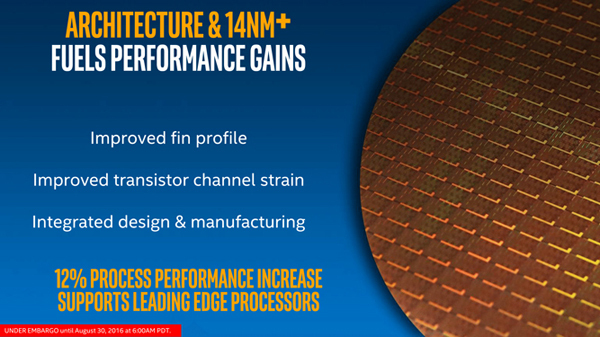 In line with that approach, Intel claims to have refined its 14nm Tri-Gate fabrication process by incorporating an improved transistor fin design for better integration and scaling. 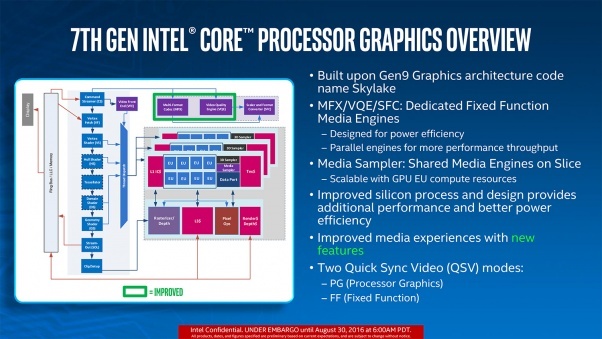 This new 14nm+ process, as Intel calls it, provides up to 12% performance boost in form of higher clock frequency. For desktop parts that’s roughly an increment of ~300MHz depending on CPU model. Speaking of models, you have your usual suspects: the 4-core/8-thread i7-7700K, 4-core/4-thread i5 7600K and the somewhat unusual 2-core/4-thread i3-7350K. Unusual is the “K” – suffix which stands for unlocked (read overclock-able) and is generally associated with highest-end i5/i7s. This is the 1st time when Intel has released an i3 with unlocked multiplier, something that enthusiasts have long been calling for. Intel did something very similar with the “Pentium anniversary edition G3258” and now it is i3’s turn to get some overclocking love! This could be a big thing but for now we’ll wait and watch. Terrible price gouging and availability issues plagued the Pentium G3258 in India, turning budget builders away. We hope the i3-7350K doesn’t suffer a similar fate! Other than that nothing is new in terms of features, core number or arrangement. We don’t yet have official confirmation on TDP (Thermal Design Power) but various reports suggest that it won’t be much different from Skylake’s. We’ll publish a full list of the new SKUs once they hit market. Let’s move on to the graphics side and things start to get more interesting. It’s no secret that Intel has been pushing the envelope of integrated graphics performance for quite some time now and with Kaby Lake the company is targeting the HTPC (Home Theater PC) segment. The new graphics engine (HD 600 series) inside of the 7th generation core has been optimized for better performance and power efficiency. The new media engine features fixed-function hardware support for full 10-bit HEVC/VP9 decode and 8-bit VP9 encode for smooth and efficient playback of 4K contents. Quick-sync, Intel’s video transecode technology, is also present – only this time it can operate in parallel with the Execution Units (EU) to deliver better quality. We don't know what kind of enhancement the new EUs will bring along but it's obvious that Kaby Lake is geared more towards media streaming than gaming. Speaking of which, IGP gaming is becoming more mainstream each year, specially with the e-sports genre gaining popularity. We’ll keep a keen eye on the gaming results of the new Kaby Lake iGPU once the benchmarks start to stack-up. If you have a good idea about how modern processors work then by now, you know what to expect from this launch. While a boost of ~300MHz is not bad at all, it’s not enough to net a substantial performance gain, especially in the high-end of things where performance doesn’t scale linearly with frequency. Apart from a few clock sensitive benchmarks, we don’t expect any dramatic improvement in performance across the board. But then, this has been the story of Intel processors in last few years where every new generation is faster than the previous but in a marginal way. Kaby Lake is not going to be an exception to that tradition, especially from a pure performance perspective. There are already some previews on the web which seem to be in agreement with these assumptions. Here is what Tom’s hardware and HardOCP found out playing with the new silicon. From the looks of it, Kaby Lake could be a better overclcker than Skylake but we’ll wait for a more general consensus on the matter.